Leicester ground out an important victory against French giants Toulouse at a boggy Welford Road to keep their Heineken Cup Pool Six hopes alive. Valentin Courrent landed a penalty to put Toulouse ahead before the Tigers hit back through Ollie Smith's try. Two Andy Goode penalties to a penalty and a drop-goal from Courrent meant Leicester led 11-9 after 55 minutes. Goode made sure of victory with a 72nd minute penalty, but Toulouse went home with an important losing bonus point. With Leicester having lost away to Leinster in their opening match in the competition they can ill-afford to lose any of their home games and they needed all their traditional grit to see off Pool Six leaders Toulouse. The French side may have an impressive pack but what they are really renowned for is their free-flowing style, while Leicester's traditional gameplan is more robust. With heavy rain having made the Welford Road pitch very boggy it suggested the visitors might take a more conservative approach than usual but there was no sign of that when the game started. The visitors, the only three-time winners of the competition, launched two scything counter attacks in the first five minutes and their early pressure paid off when Courrent edged them into the lead with a penalty. The French giants were trying to play the game at pace but it cost them dear when Clement Poitrenaud panicked when he was tackled in his 22 after the visitors took a quick throw-in. Smith, playing out of position on the wing, picked up the full-back's loose pass superbly on the run and had the pace to beat the cover and cross out wide, with Goode narrowly unable to add the conversion. As the half wore on Leicester's power game saw them secure the upper hand in the territorial battle and they gained their reward through a Goode penalty. But when the French visitors managed to establish a beachhead in the Tigers' half Courrent popped over a drop-goal to ensure they only trailed 8-6 at the break. With the pitch cutting up and the ball very greasy the match had become increasingly attritional as the half wore on but Toulouse sparked back into life immediately after the restart. When a cheeky pass from replacement Tigers scum-half Ben Youngs failed to go to hand the French side countered with a superb flowing attack. Leicester had to infringe to bring it to a halt and Courrent made no mistake to put the visitors back into the lead. However, Toulouse kept playing themselves into trouble and when Vincent Clerc threw a suicidal pass Courrent held on at the resulting ruck and Goode kicked the Tigers back into the lead. The fly-half added another penalty inside the final 10 minutes but the hosts had a huge scare when Clerc was called back for a forward pass as he cruised round under the posts. They might not have sneaked victory at the death but Toulouse did manage to stay within seven points to claim what could be a vital losing bonus point in a very tight group. Leicester travel to Toulouse next week for a rematch which will go a long way to deciding who qualifies for the knock-out stages. "It was really important to have a win, and we are pleased with that. "Sometimes, you have to manage the conditions, and it was difficult to play fast rugby in those conditions. "We needed to be more consistent when we had opportunities to score." "We are feeling pretty fatigued. They probably just played smarter than us. We will go back to the drawing board. "Our lineout was dominated, and their forwards competed very well against us. We know it will take a strong performance to beat them." 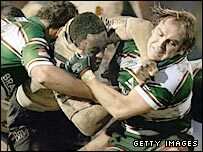 Leicester: Vesty; O Smith, Hipkiss, Mauger, Varndell; Goode, F Murphy; Ayerza, Kayser, White, L Deacon, Wentzel, Corry, Abraham, Crane. 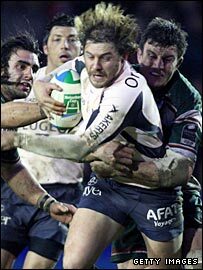 Replacements: Chuter, Castrogiovanni, Hamilton, Croft, B Youngs, J Murphy, Rabeni. Toulouse: Poitrenaud; Clerc, Jauzion, Fritz, Heymans; Courrent, Kelleher; Human, Servat, Poux, Pelous, Albacete, Nyanga, Dusatoir, Sowerby. Replacements: Lacombe, Hasan, Millochlusky, Lamboley, Elissalde, Kunavore, Medard.